We all got clobbered by another virus; either that or it's the same one; recurring. Could be; very similar symptoms; though more severe this time. I had a fever of 101.6 last night; not the end of the world, but no fun at my age. Spice says she measured her temp at 103 in the middle of the night. I'm still at 99.8. Has to be global warming! Dange fever, moving east from the swamps of Arizona. I don't remember this many episodes of weird viruses in one summer, ever. Smidgin was affected first; and least, which is good. There have been multiple discussions on laundry hereabouts; including one today in the BBC, which probably tipped my choice of topic this way. England builds desalination plant. Last line in the article; "At the moment, half of the drinking water supplied to homes is used for flushing toilets and washing dirty clothes, which is madness." !! Ya think?? Nice somebody is starting to think, anyway. So- laundry, and water, is NOT the point of this post; they're just the platform. Is water use critical? Way past. New lake?. This is a very good article; pointing out the tangle of interconnections between climate change, genocide, bad policies, and inadequate understandings. Darfur; one of the great horrors of our time, from all aspects. Water is going to continue to be a huge factor in global disturbances, as far out as anyone can see now. So. We have to CHANGE the way we use water. Duh. Everybody agrees. Immediately after that lovely agreement, all the 2,804 different viewpoints and vested interests go straight for each others throats. Not much useful discussion going on, or progess in changing anything; hence the need for England - to build a delsalination plant for drinking water, so our current wasteful ways can continue without troubling interruption or real thought. What is the sensible reaction of sensible people in this situation? Where the noise of conversation is drowning out any actual discussion, and no world body is actually capable of making any decisions? My own answer is; I'm going to live my own life as sensibly as I can, at least. Kind of all I can do; and the example might help, some decade or other. Then- we get to the real world, that nasty nasty place, where your actions have real consequences. What, this isn't a video game? I don't get 10 lives, before I get to just start over? We'd laugh, but it's so not funny. And here, in my own backyard, is a perfect example of what I'm trying to say- change is NOT EASY- and one of the barriers to real world change- is the increasing number of humans we have- who have never, ever been in touch with the real world. This is where we do our laundry; a subject we've never raised here before; largely because it's not likely to be of use, in its total process, to folks living in cities or suburbs; This is a rural process; mostly, though some aspects could be adapted. And why is the clothesline down on the ground, you ask? Ah. We'll get to that. That big water tank down at the end there is a 500 gallon tank. It's filled by our windmill, and we use that water for lots of things; showers, and the occasional watering of plants just being established in our fields. And, laundry. The basic idea here- this whole setup is on the path between the house and the greenhouse and the garden. We walk between house and other places like 6 times a day, most days. What I've developed over the years, is the habit of doing laundry- ALL DAY - EVERY DAY. In little tiny bits. You're SUPPOSED to walk down and do "the next thing" for the laundry- every time you pass. Both ways. Regardless of how big a hurry you're in. If you allow yourself to say "oh, but I'm in too big a hurry to make lunch right now, I don't have time to stop and change the laundry from soap to rinse tank, I'll do it later.." you've lost the battle; and this will not work. You will wind up not doing the laundry. So you do need the philosophical attitude that "hurry" is a bad idea, pretty much always. But if you can set up this internal habit- it's a pretty sweet system. You don't wind up spending hours doing just laundry- you do it in 5 and 10 minute bits. Then move on- usually feeling good about it, rather than overburdened. Here's what we do; you put a reasonable batch of laundry into a 30-40 gallon tank, which has a lid for it. Add soap/detergent/whatever, in the right amount, so the tank is about 2/3 full; and agitate; or "pound" as we say. Lots of different choices for pounding implements; currently we mostly use a natural rubber "plumber's helper" - which I have cut holes in, to increase the turbulence, and decrease the work. Pound the laundry up, say 100 strokes- counting is fun, with kids- put the lid on, and leave it to soak. Probably for hours, maybe in the sun, which adds heat to the water. On the way back from whatever; you stop in- pound it another 100 strokes. Leave it to soak. The decision when to shift from soapy to rinse cycle depends on how dirty your batch is, of course. It's pretty forgiving. Usually we have 2, or 3 tanks going at once; one soapy, one first rinse, one second rinse. Then, it goes onto the clothesline, for lovely outdoor sunny drying. Wonderful fresh smells. So. Spice tried this system a couple times when she first got here, and was not enthusiastic. She reverted to driving the laundry in to town, laundromat. For about 10 reasons, one of them being the price of fuel, she decided this year to give it another shot. For about 10 reasons, this time she became enthusiastic. One of those was- the height of the tanks. Something just that simple will make all the difference between success and failure- MOST OF THE TIME. I'm 6'1; my two sons are both the same-ish. Spice is "5 foot-nothing" as she puts it. She just had too much of a struggle getting soaking wet laundry out of those taller tanks. We got some that were shorter. Hey presto! it's not killing her anymore. And Smidgen loves to help, and is entertained. So. She's decided this is the future for us; a good functional cheap laundry system; and incidentally fantastic exercise- think of the money we save on gym fees and exercise equipment! But our original clothesline had died- the aspen tree it was secured to succumbed to a fungus disease- and fell over. So we needed a new clothesline. Part of the problem with the old line was the fact that it was a quicky; temporary. Wasn't done right; so now I have to do it again. One of my father's favorite jibes- "Yeah, there's never time to do a job right. But there's time to do it over; once it breaks." Building something RIGHT is incredibly satisfying. Constructing something that will last- and that will be basically USEFUL for your life, your family, is about the most rewarding activity I know. So with the help of Middle Child ( trying out a new moniker here :-) - before Smidgen, he was Younger Son; but now he has the Garrison Keillor slot-) I set out to build a clothesline for the ages. The Rolls Royce of clotheslines. We had fun building it, too. Went down to the SE quarter, and cut some black locust trees- which I had planted, decades ago- for exactly this kind of purpose. Black locust won't rot in the soil- it's better than any treated wood, no kidding. Peeled the posts- the bark will come off messily and slowly otherwise. Set the posts so they are guyed to "deadmen" - 3 foot long black locust posts totally buried - sideways - to provide tremendous anchor power. Laundry is HEAVY, you know? That beautiful line is under serious tension when loaded with wet clothes. You need to design for it. Bought 50' of plastic coated steel cable for the line. (Oh, hush; it's a good use of plastic. :-)) 50' is a LONG way- you need to allow for re-tensioning; and for - mowing the grass! So there's a big turnbuckle in the line, with a hook- a few turns and you can take the line down for mowing; if it's sagging, a few turns and it's tight. Worked great! Looked beautiful! Dried laundry! Worked so well, that Spice decided to put ALL the laundry on the line today; doing a big batch. With blankets. You can overload ANYTHING- and this is what so many people growing up protected in cities- and thinking you can always do it over, like in the video game - just DO NOT understand, in a very basic way. "It's working great! I'll just add a little more!" LIMITS. Limits. Everything has limits- and we have a society we've trained to NOT KNOW that- and it's a huge part of reaching our goals of a livable world. You want more? Bigger? YOU CAN'T HAVE IT. The world will break. The laundry overload didn't break my massive black locust posts. Didn't pull out the deadmen. Plastic coated steel cable is a little tricky to fasten; you CAN'T tie knots in it; you have to use "cable clamps". The overload actually pulled the cable out of the fiercely tightened clamp- which I had put together myself, in a pretty knowledgeable way- cable doubled back; looped, right piece down- etc. Still- stripped the plastic off; pulled the cable right out. Easy enough to fix; only took me 10 minutes. Lots of humor. But the principle remains one that worries me- how do you get people to accept limits- when they don't realize there ARE any? My concern, and experience, goes far beyond Spice. One year we had a group of GREAT interns living here for the summer. All exceptionally bright. And all city kids. They broke every machine on the farm, eventually. "The mower is doing great in this foot high grass; I'm going to mow the 18" tall grass over there next..." Nope. CAN'T. Overload. Burn up the belts, if you're lucky; burn up the transmission or overheat the engine, if you're not. "Well, how was I supposed to know??" in anguish. Good question. We need good answers. It used to be called "common sense" - but how do you teach that? What we're overloading is the Earth- and it's mostly the result of millions of tiny overloads; from clueless humans; far too many of whom do not know "overload" is even possible. Sorry guys. Should be doing something substantive here pretty soon. A number of things have ganged up on me to keep me buried in alligators; way past "up to may ahem in" or "up to my eyes" as I usually say. Today part of the alligator mob IS connected with being off the grid. My AC power for the house has been going fritzy; and we need 110 volts AC for the phone answering system (which, of course, runs off 6 VDC - but which blows if you try putting 6VDC into it from your batteries. Done that- for years; killed at least 8 systems - has to do with different grounds between house and phone line.........) and we need the 110AC to - charge the laptop computer. Which, of course, uses 24VDC- hard to get from 12V, anyway. So I've spent the day without phones, ran the laptop battery down to 5%- finally gave up and devoted all my time to troubleshooting the power system. So far- decision 1) it's the switch; inverter seems to be shutting down because not enough DC current is getting through. Replaced the switch; twice- uh, nope. 2) it's the inverter getting old and cranky- replaced inverter with backup (I have TWO) - uh, nope, still starts, dies, regardless of inverter. Now, I DID already go through the "sequential unplugging" process that is normally the first step; looking for some attached device or branch line that is causing the problem - didn't find any. But- that's what it is. Somehow, I must have missed a step in the unplugging process; because now the problem is isolated to some part of the downstairs line. Phone is back; computer is charging- ultimate cause not yet ferreted out. But I'll be able to sleep, anyway. There's the thing about being off grid, again. You do have to rely considerably ON YOURSELF to fix problems. Can't call up ConEd and complain- it's not their problem. Fine for some. Pain in the neck regardless. But there IS a substantial personal satisfaction when you personally find the blankety blank blank problem- and FIX it. Feels good. Halfway there; got a ways to go. Sigh. I find myself pretty constantly frustrated with this blog. Because I sometimes just plain really do not have time enough to do it- and you- justice. Brian M- Sean- and a dozen others- I really really hope I'll be able to continue the discussion and speak to your points. But it sure ain't gonna happen in the next couple days. That's something to remember here- if I suddenly get quiet for a couple days; count on it- I haven't abandoned the blog, I'm just up to my eyes in alligators for a while. I started answering Caroline's very nice comment on the previous post; it got longer; and longer- so I finally realized it would be best dealt with here. She said; "I don't know how we're going to teach our kids to see those limits other than by living in a way that shows sensitivity to the fact that there isn't infinite amounts of anything." Teach the kids. That's absolutely one of the most important things we need to focus on. There's an awful lot of older folks who will never learn; never understand, never change. It's the kids. And thinking about "how", and how this can relate to the real world (ie. NOT little houses in the woods, but Little Tiny Apartments In The Incredibly Huge City) - I found myself starting to tell this story. It does turn out relevant, I think. Aeons ago, my son Beelar was asked as a school exercise to "write down your favorite food recipe". This had to be 3rd grade, I think. An assignment teaching both handwriting, and the beginnings of composition, and story telling. We got called in to talk to the Principal about it. No, really- the teachers were in an uproar about his recipe/essay. Man, I wish I had a copy of it- but it happened back before computers. Paper disappears; if it's in the computer, I can find it. He chose "Spaghetti" as his recipe. Ok, how weird can that be? Then he started off: "First, you plant the tomatoes..."
You have to understand, he was UTTERLY serious; not a bit of smart mouth going on. This was his answer- this is how you make spaghetti. The part that really freaked the teachers out though, was when he got to "Then, you add some ground Bambi..."
Ok, now THAT was smartmouthing; he knew that "regular folks" don't talk about ground venison that way. But WE did. Not in any attempt to be callous- we still loved the lovable parts of the movie; and deer- but in an attempt to be HONEST about what we were doing. We're eating deer. Right here, in the spaghetti; not hiding the fact from the kids. You have to shoot the deer- and gut it, and butcher it, and store it- to get this. All wrapped up in that wiseacre "ground Bambi". The teachers really didn't know what to make of this; was our child being warped? Abused? What the heck? We managed to convince them the boy was not in danger; and not really warped- just with a different viewpoint; but it took some fancy dancing, and put us on the FBI's permanent "Watch" list, I think. He KNEW what goes into spaghetti. You plant tomatoes; and weed them; and can them; and you kill animals; and butcher them. He knew because he'd seen it; and helped do it. I really don't think he can see a can of tomatoes on the shelf at Walmart without seeing also.... the tomato plant- in Florida- the can, on a truck... etc. Likewise with the package of hamburger. How is this relevant to the City? I'm not suggesting you should go out and shoot pigeons, or squirrels, for your soup- just a bit impractical, never mind the legalities. But even in the City- you have a windowsill. It can grow SOME of what goes in to your food. One pepper plant? One tomato plant? A pot of sage, thyme, oregano- chives? Each child can have their own- it's their job to care for it, water it, grow it, harvest it- add it to the ... pizza. You can have a special meal where most of ingredients come from the window; and the family shares- harvest; cooking, sharing. They'll start to get the idea. Wow; just growing the peppers was a LOT of work. Hm... You can nudge them into understanding a little more. Of course, in the burbs, it's easier. 10 tomato plants- and canning the crop. You DON'T have to do industrial quantities. What you DO want to do is get the kids INVOLVED - on a comfortable level. Actually, my own father having grown up on a truck farm, he always planted vast food gardens, and dragooned the kids into "working" in them. I hated it. He was astonished when I started planting my own; me too. I think it's possible to get kids involved without making it into something to be avoided. It's an old situation; and an old answer. Look in Laura Ingalls Wilder's book "Farmer Boy". Chapter 16, "Independence Day". Almanzo asks his father for a nickel (5¢) - because the other boys dare him to- they don't think his father will, since boys rarely had money at all. His father is talking to an adult friend- they're amazed at this forward child. "What for?" his father says. Almanzo stutters out a story about needing to buy lemonade... Father is not dumb, and sees more of what's really going on. He pulls out - not a nickel; but a half dollar; 50¢; ten times as much. Then he makes Almanzo answer a long series of questions- for the benefit of the adult friend. "You know how to grow potatoes, son? What do you do first?" Almanzo knows; he's been helping grow potatoes since forever, and he actually loves it. It takes all year- including storage, selecting/preparing the seed; plowing, planting, weeding, digging, sorting, hauling, back to storing- the selling- and what is a bushel of potatoes worth? Hauled in to town? Half a dollar. Father gives Almanzo the entire 50¢, to do with as he likes. As long as he understands- all the work, the whole year long, that went into a bushel of potatoes, is in that half dollar. But only because- he knows what good work is; and what it's worth. There is a connection between understanding work, and understanding limits. If what you have is the result of your own work- it IS limited. You can't work to an infinite extent- it will kill you to try. Eventually the connection comes- no one else can work "infinitely" either. Everything has limits- you can know this in your bones. But not if all you've ever done is plug in a toy. We CAN give that comprehension to our kids; but in this world, you have to make the effort to give it to them. Otherwise, it's TV and video. And if you haven't seen No Impact Man's post today, that's where you should go next, because he clearly "gets it." This post came to mind because a commenter over on Crhuncky Chincken was asking "how much water use is 'normal' ? Where should my target be?" - and my own answer was far far from the answers they were finding. Humans have spent the last couple centuries striving to make life easier and easier. It's been a major goal of the species; the reduction of "drudgery", also called "soul killing drudgery". Lots of philosophical discussion about it; art works, poetry, and everything. 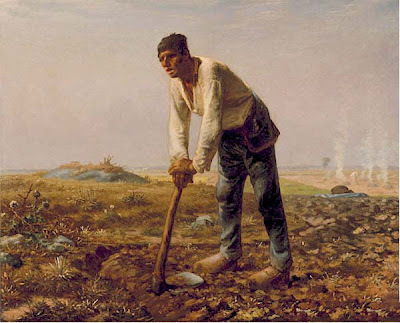 Millet's "Man with a hoe." Soul killing was generally agreed to be bad. Why chop wood, and carry it inside every hour to keep your children from freezing? Ben Franklin came up with a stove that cut down on the volume- then there was coal- then oil furnaces that didn't have to be stoked- etc. All most 1st worlders ever do now for heat is check the thermostat, and pay a bill. Back when somebody had to GATHER and CARRY the firewood; they were probably a lot more careful about waste. Same is true with water. In the Little House, we have to CARRY it. So - do the teenagers just let the faucet run while they brush their teeth? Not on your tintype; they scream bloody murder if somebody is wasting water- and they have to carry extra. So- instead of the "normal" 60 gallons a day for 2 people- we use about 15 gallons a day in the summer, for 3. Showers and all. Actually, it just becomes second nature for everyone in the house to not waste water. No arguments. Why would you do that?? Electricity? Plug the new whatever into the wall; pay the bill; it's infinite, right? If you take a look at my "green principle #2" - it's "Limited power- house electricity has 4 golf cart batteries." It's NOT AN ACCIDENT that the power system is so limited. We use electricity for :#1 Light; #2 Computers (work) #3 Entertainment (radio; DVDs- sanity maintenance). Those are the priorities; pretty obviously sensible to anyone. There's just not enough power to run a fridge, or a dishwasher, or a washing machine. Acquiring enough solar panels or other sensible generation capacity; and the STORAGE for that energy; would be many thousands of dollars. So; I've got $4K here- what shall we do with it? There's always something more urgent; or more desirable. My first crop of kids remember kerosene lights; and candles made from deer tallow (yuck! stinky!) When we got solar panels, and A battery, and A fluorescent light bulb for the kitchen/dining room/living room - it was a BIG BIG deal. Wow. No stinky kerosene in the house; no fire hazard; VASTLY more, and better light. What a wonderful thing! Which of course everyone takes totally for granted these days. You have to LIVE without it to appreciate it (rustic vacations don't really count). A couple years later- we really needed to have a computer in the house, for my work. So. Money for a) computer, b) more solar panels, c) more batteries. Took a while to get there. Zowie! Computer. Besides my work, there was sometimes enough power for computer GAMES- a little bit. They were slightly beyond "Pong" at this point; 1984; not much addiction potential. The reality of solar power; and wind; is that the availability is VARIABLE. It's the nature of nature. 8 sunny days in a row? The batteries are FULL - actually you may be in danger of damaging them unless you use some of it up, or cut the input- you have to DO something. Boiling batteries are not funny - I've done it, and I don't do it any more. So; we added a TV. Part of that was a conscious parenting decision NOT to keep our kids isolated from the rest of the world. Look, they're already weird enough to their peers- living like this; why should they also be missing all the normal cultural references? Big Bird? What's that? So we plugged them in to Sesame Street. And a few other things. The REALITY was there. And easy to present. "You guys NEED to watch AMVOCAW? All your friends do? I understand. Go ahead." "what, really??" "Sure. You just have to remember- if you watch that now- it's using up electricity, right? From the batteries. There won't be enough energy tonight for the lights. Your choice." You can extrapolate this experience to your own house- and also to the world. The vast majority of 1st worlders have been raised to KNOW that "leisure" and comfort are their absolute right; as it is their right to go out and buy the biggest outboard motor they can, for fun on weekends. There are no limits in sight. The supply is endless- and the system has been set up to encourage that belief. At the moment, China and India, and everyone else in the developing world is busy buying into this same illusion. You and I and Al Gore KNOW it's an illusion- but the huge majority of humans DO NOT; and they cannot SEE - the limits. All they can see is that YOU have two SUVs, and they want theirs. We have to find ways to make the limits tangible; and ways to encourage people to see them; live with them. I think my proposal on energy pricing; where The more you use, the more you pay is a step in that direction. The reason for moving to that kind of pricing is comprehensible; the visible "limit" would be the "annual allowance" of very inexpensive energy. Beyond that; society says you must pay steeper and steeper prices- because- it's a limited resource, and we all know it. It's visible; palpable- accepted. The problem we must tackle: All our supply systems are designed to work "on demand". Turn it on- the whole world supply of elecricity/water/gas/waste handling/whatever is plugged in and at your command, your majesty. It's a design guaranteed to CAUSE waste. It cannot fail. We need to fix this in our own homes, first of all. I've found ways- mostly by just being unplugged from the big delivery systems. There have to be more ways- easier to put in place, more adaptable to cities- etc. We- you and I- need to find them. Put your thinking caps on. You can bet your little booties I'll turn it off as soon as I get this posted and leave the desk, though. I'm wondering if ColinAKANIM has a little fan; or is going to get one soon? It's going to be stifling hot in that NY city apartment, if it isn't already. And a little fan can make a huge difference in livability. I bet that solar panel, and battery, he's got - would support SOME fan use. How do you teach your kids to SEE and honor the limits? How do we get the rest of the world to see? I think this is all a pretty big deal. This is another one of those days when something in the news just drives me crazy. In this case, it's here, on the BBC internet news: Amazing News!. Here it is, announced by a usually reputable news source, that "Villagers in central China have been using dinosaur bones as medicine - thinking they were from dragons. These bones have been dug up, then boiled in soup or ground down to make traditional medicines for decades. The news emerged this week when scientists displayed some excavated bones at a museum in Henan Province." I didn't actually scream in anger; but almost. This is UTTERLY not news; basically ANYONE with a real education in any biological field SHOULD KNOW THAT. Why? Because it WAS huge, world-wide news already. In 1929. Ever hear of "Peking Man"? Know how they found him? In the drugstore, that's how. Zhoukoudian. Actually, scientists knew "dragon bones" were fossils, and were looking at them, in the late 1800's. And Zhoukoudian, the site of Peking Man's discovery, is a UNESCO World Heritage Site, for crying out loud. Hardly obscure. It's an incredibly widely known story. And here it is- not only did the scientists involved in the new story apparently not know, but neither did the story writer- NOR THE EDITORS. So why am I ranting about this here? Because this phenomenon, and all our environmental disasters, are very closely related. Through the very serious, and growing, failure of our higher education systems and institutions. This phenomenon of ill-trained young scientists announcing "discoveries" - that are decades, or sometimes centuries old- is not only astonishingly wasteful, but dangerous. Globally, earth-threateningly, dangerous. The problem needs to be societally recognized, and very seriously addressed. I'll give just one recent example here; in Genetic Engineering. Just last week, the NYT printed another "Scientists Astonished" article; that did NOT astonish me, nor my colleagues in evolution. What, Genes are Complex? The morons running the genetic engineering scams out there have finally had to admit that- gosh, it just ain't as simple as they said it was in all those corporate Prospectuses. They came up with a concept called "junk DNA" - basically the concept was that MOST of any organism's DNA - must be functionless- since THEY COULDN'T UNDERSTAND WHAT IT DID. And now, after decades of profitless corporations, and billions of dollars wasted, it's dawning on them that gee-golly, apparently all that DNA does actually DO something - like turn processes on, and off, for instance. Evolutionary biologists never thought "junk DNA" was a sensible idea; in fact there are abundant reasons to KNOW otherwise. Guess what? ALL that DNA has a function- much of it very complex regulatory stuff. The morons just have no clue how it works. The rest of biology hopes these numnums will eventually actually... GO OUTSIDE their lab, and LOOK AT A FROG - in a pond. And watch it; and the pond; for at least an hour. Instead of looking at pictures of frog cells in the library. It is not the same thing. I don't really have to explain to this audience what the consequences of this stupidity are- beyond utterly wasted capital resources; projects launched that are doomed to fail, false hopes, and careers ending in brick walls. I contend this whole phenomenon of utterly uneducated PhDs is one of the leading causes of environmental catastrophe. You can find one who'll believe anything the CEO wants him/her to. Because... they do NOT get a genuine education. They get trained in minutiae; and often ONLY that. If we're going to be able to change our species' behavior (and we know we have to) we desperately need accurate information; informed judgment. And we are NOT getting it from our universities these days. Some of it, to be sure, is the result of the vastly increased amount of "information" that's out there. But some of it just because of "grade" and "degree" inflation; and the complacency of all the complicit. Folks, many thanks for the kind words and thoughts about my bug; I'm one of those who is convinced kind words truly help. I'm getting around a bit; and apart from the weakness from lying dead for 3 days, recovery looks straightforward. Can't really work outside yet; tried a little and was having my vision "white out" on me just from walking up a little hill; normally a symptom of heat exhaustion for me; shouldn't have been that exhausted. Here are some pics and comments on our first Whole Planet Picnic (we've been having a bonfire on the solstice for 15 years, but we're shifting focus); and the following Earth Lent week- the participation was a little light this first year- not as much time to get the word out as it needed, for sure; but we'll be continuing, and doing a bit more next year. This is our normal venue- a substantial meadow, mowed so we can get around just a few days before. You can see tables with food, chairs, and off to the extreme right the bonfire pile; our big attraction. Having to cancel because of thunderstorms did mess up things a good bit. A fair number of folks had made plans to be here on Thursday; thanfully not too many from too far away. Though we did wind up with some in the Little House until pretty late; good friends from more than 100 miles off. That was very nice, for sure; but not what anyone had planned. Though we got folks notified about the change to Saturday- of course; the majority of folks had plans already at this point. Ah, well. Next year! Basically we've had groups of from 6 to 50 for this event; last year we had 40+; weather and timing does always make a difference. and a lovely half-moon. It gets dark, with no extra lights around! Hence the blurry hand held photos; flash is just yucky for things like this; I'd rather have the blur. We've never had a problem with conversation - folks find plenty to talk about. There are several friends where this is the only time we see them, all year. An added incentive to make the trip, really. Only one kid this time; Smidgen, who had a wonderful time adventuring from one group of adults to another- all alone, in the dark. First time she's really been that adventurous; sometimes she crossed 100 feet of grass, all alone (with about 8 sets of adult eyes watching every step). Fun. good fireflies, but they didn't like the mowed area much. remember why we postponed? Rain? The fire pile was wet, and much harder to get going than most. Oddly, a good fire brings out the latent pyromaniacs; no trouble finding volunteers to "fix" the fire, and get it going; that's one there, to the left. When it gets going- it's something. Remember the tables and chairs? That's them, to the left, looking tiny. Lights up the whole little valley, and throws sparks 100' into the air. Yes, we're waiting for one to get away; but it hasn't ever happened. Usually on this date you can count on VERY heavy dew, wetting everything, by 10 PM; another reason to wait. But we have a pond, and hose, in case. Took a good half hour to start to die down. Lots of conversations. There is, indeed, something primal about a fire. Two days later, when it had thoroughly cooled, I swept up the wood ash to use as a soil amendment, fighting the constant trend of our soil to shift into the acid range. Recycle. Folks started to leave about 11; last ones left about 12:30; sometimes it's gone until 2. Alas, our musicians were mostly not able to make the rescheduled date. But it was an excellent time. Leading up to- Earth Lent Week. I'm not going to list all the activities here that I know about; just a few; inevitably, one smart alec friend from Minneapolis assured me he would give up snow shoveling for Earth Lent. Another good friend from Yonkers gave up something more substantial; his elevator; and he lives on the 4th floor. A great thing to try. Spice gave up plastic bags- but I'm afraid she may have lapsed. I gave up-pudding. Cigars. Lobster. eeeew! LOL! I can SEE you squirm. Two reasons- one, it's pretty hard for me to find something to give up! Already have, lots of things. Two; we already use very little water; a 50 gallon drum pumped by the windmill usually lasts 3 people for 6 days or more, down at the house. But the shower is different; comes from a different tank. So; by way of cutting some usage- I did without (ok, except hands for dinner). "When they found out afterwards that one of the odours was from a chimp, there was laughter. When they realised that two out of three had preferred the chimp, there was nervous laughter." So. The truth! That's what I did. It does help keep you "mindful"; a good exercise always, and not onerous for just a week. And, I confess, I'm now back to regular showers. So you can relax. And- if you have stories about your own Whole Planet Picnic; and/or would like to tell about your Earth Lent decisions; please put them here as comments. And let me know if you have pictures you're waiting to send; I'd love to see them, and I've got to kick a couple people to get an email address set up to accept them. I can kick harder if I've got people waiting. I got hit by a bug. Virus, in this case, which our doctor says is "going around" right now. So I've literally been dead asleep the last 3 days- not something I make a habit of; in fact it's very rare for me to be able to sleep more than a "normal" amount; but with this bug, I have not been able to do anything else. We have two mosquito born viruses possible here; West Nile, and a regional viral encephalitis; neither is one to take lightly. All my symptoms fell into the West Nile grouping at first, so I've been having fun wondering if I was going to wind up one of the few who actually get nailed by it. Apparently not. Actually got hit by it right in the middle of preparing a post with pictures of the Whole Planet Picnic here- so, that'll be coming up next.